Several of the most well-known novels by Maori authors of the past decades feature a very special child that stands at the centre of the story as the saviour of its people, such as Simon in The Bone People, Toko in Potiki, Grace in Once Were Warriors, and Kahu in The Whale Rider. Representing Nature, Magic, and Origin, this child appears to be of Romantic descent, and just as during Romanticism it is used for the political purpose of criticizing the project of Modernity and its focus upon progress, materialism, and rationality. The symbolic importance of these children is emphasized in the novels through their dramatic deaths, or near-deaths, which are sacrificial in that they are the direct cause of their communities to change towards a more traditional way of life. 1In 1994 Lee Tamahori’s film version of Alan Duff’s brutal novel Once Were Warriors became New Zealand’s most successful film export. It was described as an eye-opener that shocked people into awareness of the harsh lives in the impoverished areas outside the big cities, not just in New Zealand, but in many Western countries. What touched movie goers especially was the uncompromising portrayal of how the destructive cycle of unemployment and alcoholism results in wrecked childhoods: as in the Heke family where one daughter commits suicide after having been sexually abused by an uncle, one son joins a violent gang and is killed in a gunfight, and another son ends up in juvenile detention, while the younger children are shown cowering in their room as their father furiously beats his wife up after heavy drinking bouts with his mates. 2The suffering child is a powerful image that attracts attention and sympathy, and it allows Duff to fully expose the horrors of poverty and discrimination while simultaneously bringing the Maori people to task for their complicity in their own misery, since it is the children, rather than the adults, who are portrayed as victims. Though few Maori writers share Alan Duffs conviction that the Maori people have mainly themselves to blame for their marginalization in New Zealand society, the child is a recurring figure in several of the most well-known novels by prominent Maori writers from the 1980’s and 90’s. This was a period when authors of Maori descent became more visible on the literary scene, and their fiction became more overtly political. The emergence of a focus on the child appears to be linked to this political purpose, and what has caught my attention is the frequency with which the child has come to symbolize both the problematic present and a Utopian future in so many of these novels. 3In some of the novels a particular pattern emerges in which the child fills the function of redemptive saviour in that its suffering, or even death, is instrumental in the Maori community’s recovery of its pride and traditional way of living. The suffering of the children in Once Were Warriors in this way functions as the incitement for the battered mother of the family to take control of her life and even start a school for the children of the area to keep them off the streets and teach them about the once positive connotations of a Maori identity. The other novels that I have chosen to look at in this study all share this movement from a state of lack and dissolution to a healing of the community through changes that are in some way brought on by the suffering or death of a child. In Keri Hulme’s The Bone People from 1984 we are kept in suspense as a little boy is unconscious for over a week after being beaten by his step-father, just as Kahu in Witi Ihimaera’s The Whale Rider from 1987 is on the verge of dying after her brave rescue of a whale but wakes up to a world that has changed for the better because of her self-sacrifice. The children are reborn after a symbolic death, as it were, and the world is reborn through them, which is also what happens in the fourth novel I have chosen, Patricia Grace’s Potiki from 1986, except that for the boy Toko it is the rebirth that is symbolic, while his death is real. The child’s suffering is an indictment of modern society and its lack of compassion and authenticity, but it is also emblematic of the suffering of the Maori people, in that the child in a Christ-like manner takes upon itself the suffering of its people and clears it of the faults of the past through its death. 4To study the reasons for this use of the child in these novels I have used the theoretical framework developed by childhood theorists, primarily from the fields of sociology and history, who look at childhood as a construct. Since the publication of historian Philippe Ariès’s book Centuries of Childhood: A Social History of Family Life in 1962 where he famously stated that "in medieval society the idea of childhood did not exist," the constructed nature of the concept of childhood has become increasingly important as a premise for childhood research.1 As leading sociologists Alan Prout and Allison James state: "The immaturity of children is a biological fact of life but the ways in which this immaturity is understood and made meaningful is a fact of culture. "2 The child in literature is thus not only an image that reveals what meanings a society invests in the concept of childhood, but it can also reveal the concerns that are central to a certain culture at a certain time. 6This cultural crisis has then made the child a central figure in the Maori struggle to retain and revive traditions that would help to establish a sense of pride in Maori identity. In the novels that I have studied the theme of the devoted grandchild occurs as a means to counter the loss of the child as the bearer of traditions, as they portray children who actively seek their grandparents’advice and knowledge. Kahu in The Whale Rider, and Toko in Potiki, for example, have close relationships with their grandparents, and they also represent the link between the past and the present, being in some sense reincarnations of important ancestors. In The Bone People and in Once Were Warriors, though those novels are more ambivalent in relation to the Maori heritage, the eventual acceptance on the part of the younger generation to learn from the elders is central to the novels’resolutions. While the Maori population becomes increasingly urbanized, these novels in many ways present the realization of the dream of the child who does not leave the old tribal lands but stays and becomes the new Maori leader. 7It is not only as leader, however, that this child unifies the tribe, but as a godlike symbol for the lost past. While being an inevitable representative of the future, the child also has become an embodiment of nostalgia for an imagined golden age. While the link between grandparent and grandchild in Maori society to a certain extent explains the link between the child and the past, the content of this nostalgia makes it important to look at the literary history of childhood as well. The most important period in the creation of the contemporary literary idea of childhood is without doubt the Romantic era, when William Wordsworth wrote his famous "Ode: Intimations of Immortality from Recollections of Early Childhood" in which the time of childhood is mourned, as the poet regrets that "there hath past away a glory from the earth." The child growing up becomes a metaphor for humanity’s growing away from the time of Jean-Jacques Rousseau’s "Noble Savage," as the Romantics idealize childhood and primitive man for being closer to a natural state without the cynicism and materialism they believe is the mark of their contemporary world. 8The child, who had previously been thought rather uninteresting by poets, became a central figure, even an image of the poetic genius itself. While the adult mind was unimaginative and coldly rational, the child’s mind was poetic by nature and was ruled by emotion and imagination. The child could in this way be used to criticize modernity and the scientific revolution, as Romanticism outlined itself in opposition to the Enlightenment. This is of course not just a matter of aesthetics, but an important part of the politics of the day, as for instance Rousseau’s Emile was banned for its revolutionary suggestion that the child, or the subordinate, might be wiser than the adult. The child became a vehicle for political protest, as it could be made to represent a Utopian dream set in the past. 9Today this Romantic child remains a vital part of the way that children are perceived and described. Anne Higonnet says, in her book Pictures of Innocence: The History and Crisis of Ideal Childhood, that «when Romanticism waned, childhood remained Romantic».4 The child is allied with Nature, with spiritual matters, and with the unconscious. In this respect the child is constructed in a similar way to the construction of indigenous peoples. The Child and the Native have been each others’metaphors from the very beginning of colonialism, from being described as brutes in need of discipline and education in the 17th and 18th centuries, to sharing the original innocence of Rousseau’s "Noble Savage" in the 19th century, and later, towards the turn of the century, the theme recurs in Sigmund Freud’s use of the child as a representative for the primitive past of the human mind in his comparison between the Id and the child. In this way the child becomes an opposite that the ruling group can use to outline itself against. The child is made to represent qualities the adults claim to admire, such as simplicity and purity, while distancing themselves from those qualities by placing them in someone else. 11This inclusion of a Western Romantic tradition in novels that have as their purpose to criticize colonialism and the destruction of an indigenous culture may of course seem contradictory. It must be remembered, however, that the Romantic ideals influenced the colonial enterprise and affected the way that the indigenous peoples were percieved, not only by the European colonialists, but also by the Maori people themselves. Through missionaries and "native schools"efforts were made to ‘assimilate’ the indigenous population to a Western world view already by the mid 19th century. This politics of assimilation continued unquestioned by the white majority up until the late 1970s when political protests by Maori movements made the Maori culture and language accepted as parts of the New Zealand identity. It remains difficult, however, to study any such thing as a ‘pure’ Maori world view, or view of the child, since the Maori culture, like any other culture, has changed dramatically over the past two hundred years. 7 Witi IHimaera, The Whale Rider, Auckland, Heinemann, 1987, 37-39, 129-31. 12While some parts of the depiction of children in these novels seem to be specific for a Maori way of life, such as the importance of transferring the history of the tribe from grandparent to grandchild, the Romantic idealization of the child does seem to be European in origin. In Grace’s Potiki and in Ihimaera’s The Whale Rider it is possible to see how a Maori and a Western idea of the child contest against each other in the depiction of children. The wordsworthian idea that childhood and innocence in itself is a form of wisdom precisely because of the child’s lack of knowledge is alien to the Maori view of knowledge and wisdom, which is primarily seen as a property of the elders. Old age automatically entails respect, unlike in Western societies where youth is favored. While the elders of these novels are for this reason unwilling to listen to the children, they are eventually forced to accept the children’s form of intutitive and magic wisdom given them by their connection to another realm. In this way Toko is given "special oldness" allowing him to speak in the whare nui "even though speaking is mostly done by those who are old. "6 Similarly in The Whale Rider the girl Kahu appears to be familiar with ancient Maori rituals already as a baby, her innocent dribbling underscoring the genuineness of her connection to the tribal ancestor she was named after. Her grandfather, however, rejcts all the signs until Kahu sacrifices herself for the tribe by riding a stranded whale out to sea, through a magic time warp the same whale that brought their ancestor to New Zealand a thousand years ago.7 Childhood as entailing a special form of wisdom through the innocence and magic capacity of the Romantic child is thus used to criticize the Maori emphasis on the infallibility of the elders. 9 Ihimaera Witi, The New Net Goes Fishing, Auckland, Heinemann, 1977. 13A direct Romantic influence on the view of childhood can also be seen in some of the texts, for instance in Potiki where Toko is kept home from school to be taught instead Maori stories and myths by his mother. This opposition to the school is very similar to Jean-Jacques Roussseau’s critique of the school as destroying the young mind by teaching children "matters utterly remote from their minds".8 The understanding of knowledge is again at stake, since the child is seen as losing the innate wisdom of childhood by being taught the Western sciences. The critique against an Enlightenment ideal of empirical science is thus carried from Rousseau to contemporary New Zealand through positing the child as a representative of other forms of knowledge. A clear Romantic influence can also be seen in Witi Ihimaera’s short story "I, Ozymandias" that has as an intertext Percy Bysshe Shelley’s poem "Ozymandias" about an Egyptian king whose monuments are found in ruins, almost covered by the desert sand.9 The sense of loss and the transience of power are in Ihimaera’s story used to underline the loss of the golden age of childhood, as a young man happens to pass his childhood friend in a prison farm. Remembering their playing by the river as children, promising each other to "always be friends," as the time that was "the best of my life," he regrets having to grow up into a Pakeha world that splits the Maori community apart.10 The Maori world is equated with a pastoral childhood, while the Pakeha cities that attract the young Maori men and women are criticized for keeping people at a distance from each other and destroying the weak. 14In the story "I, Ozymandias" the fate of the young Maori man who is sent to prison is made more poignant through the description of him as a child. The carefree happy child is innocent by definition and its suffering is therefore blameless. The suffering child has for this reason been central to the depiction of injustice at least since William Blake wrote his Songs of Innocence and of Experience, and since the novels of Charles Dickens. When the child suffers it is seen as a crime against the nature of things, because happiness and a carefree existence have come to be seen as the very essence of childhood. Innocence has implied ignorance, and ignorance especially of the dark side of life. 15An even stronger emotional appeal is made by the death of a child, and in Romantic and Victorian literature the trope of the dying child became so widely used it was almost a commonplace. Franco Ferrucci, who has studied the deaths of children in Romantic poetry, says of William Wordsworth that: "As a child executioner, Wordsworth is exceedingly active" and in the 19th century Death and the Child became close companions so that towards the end of the century it was a rare child who would survive the end of a novel.11 Childhood had become an enclosed idyllic garden of happiness and ignorant bliss, an idyll that would be ruined if the child grew up and was tainted by puberty. The child therefore had to die in order for Childhood to be preserved. 16The reason why the child as victim is so important in literature is also its status as an outsider of its society. In René Girard’s study of the sacrificial victim he points out that "exterior and marginal groups" such as "prisoners of war, slaves, small children, and the handicapped" are "sacrificeable," and that even the king is sacrificeable because he does not fully belong to the society over which he rules.12 Through the mythologization of childhood the child has become the Other, not fully human, and yet a reflection surface that helps define what a human being is. The child is defined primarily through its lacks in relation to the full human being: unlike the adult the child is unselfconscious, unprejudiced, unconstrained by the limitations of language and rationality, and unaware of the passing of time. Like the Noble Savage or the 19th century Angel in the House, the child can provide a sense of timeless refuge from a changing and threatening world. The Other, however, is always in some sense sacrificed since it exists only as reflection, which is also what makes it sacrificeable since its death is cathartic and can revert the destruction of its society. 17The sacrificial victim must therefore be someone not quite part of society, and yet important and similar enough for its loss to be tangible. While the Native, or the indigene, has often been made to fill the part of innocent victim in earlier novels, the Maori authors naturally refuse this part for themselves since innocence also implies lack of knowledge. In Duff’s novel Once Were Warriors, the Maori community is presented as far from innocent and pastoral. The urban world of poverty and unemployment is shown as a place of disillusion and despair. The Maori characters of his novel have no sense of their own culture or pride in their identity, and the glimmer of light or hope comes mainly through the child Grace who is both wiser and kinder than her alcoholic parents. The opposition between the urban and the rural has been linked to Romantic childhood since Rousseau declared that his model child Emile should not be allowed anywhere near the degenerate cities of 18th_ century France until he was an adult, since just setting foot in them would compromise his natural goodness and innocence. It has become axiomatic that the child naturally belongs in the countryside and that a child in the city is somehow wrong: a street child who knows more than he should, or a gang member threatening the adult world through a complete lack of respect for the rules of society. 18Despite all the flaws of her surroundings Grace, in Once Were Warriors, manages to retain the purity of the Romantic child. While her brothers become the archetypal urban children of gangs and crime, she tries to hold the family together, guarding also over childhood innocence as she takes care of her younger siblings while her parents drink and fight. The purity of the Romantic child is destroyed, however, when Grace is sexually abused by her uncle, and the belief in childhood innocence can then only be restored by her death. Grace kills herself, and as a symbol rather than a living person, she becomes a vehicle for change as her mother gives up drinking and begins to teach Maori traditions to the neglected kids of the area. The child is in this way subordinated to the ideas of childhood, as it is the dream of a pure childhood that saves or redeems the community rather than a living child. 19In Keri Hulme’s The Bone People a little boy, Simon, is in a similar way a victim of the cruelty of the adult world, and though he does not die he is maimed for life when he is beaten by his adoptive father. Besides being an orphan child with all its connotations of suffering innocence and mysterious origin, the boy is mute and is also for this reason set apart from the rest of society. He appears in the novel as a saint, haloed and with a special mission to reform the lonely life of the novel’s main character, the alter ego of the writer herself. Like the child of Romanticism he is in contact with spirits and also almost reads people’s minds, being interested more in the emotions that people project than in what they say, because he himself lacks a spoken language. Gradually throughout the novel he becomes an icon of childhood, or a "sunchild" as the main character Kerewin Holmes, starts to call him, though at first she resented his childishness and thought of him as the "little creep". Kerewin’s adjustment to the ‘proper’ way of relating to a child also signals her change from eccentric recluse to being part of an unusual but still fully recognisable nuclear family. Simon, though, is regularly beaten by his adoptive father Joe, and after a particularly savage beating he ends up in a coma for weeks and when he finally wakes up he is deaf as well as mute. He is thus locked in a world without language, as incapable of growing up into a self-sufficient adult as if he had indeed died. He has been crushed into a state that can be likened to a perpetual state of childhood, since he is described as having lost his language and his individuality, while the only thing left is his love and need for Joe and Kerewin. He is sacrificed as an emblem of childhood since it is only after his near-death and subsequent transformation that his adoptive parents are redeemed from their old mistakes and can begin to heal their own lives. This healing is then illustrated by Kerewin’s gathering of her estranged family and the rebuilding of their whare nui. 20Hulme has claimed that child beating is a Western bad habit and that it came to New Zealand with colonialism, presenting the pre-contact Maori life as a paradise in this respect. There seems to be little evidence supporting her case, but her use of Edenic childhood as an opposite of a degenerate Western world is clearly Romantic in origin. A similar use of the child to emphasise the idyllic and pastoral nature of the pre-contact Maori world can be found in Maori chieftainess and scholar Makereti’s 1930’s thesis entitled The Old-Time Maori, written at Oxford University. A whole chapter of her book speaks of the role of the child in Maori society, and she argues that in the past the relationship between parents and their children was one of pervading harmony: "The Maori had a very great love for their children [...] I doubt if any other race could surpass them in their love for their children" [...] and they "never beat their children, but were always kind to them ".13 This rather categorical statement does, of course, appear to be an exaggeration, since at some point at least one Maori parent must have been less than kind to a child, but it is interesting to note that Makereti here feeds into the Romantic idea of civilization as a fall from grace, exemplified through the relation between children and parents. Children represent Nature, and their place in a society signals how close that society is to its origin and to the natural world. Makereti then demonstrates how the Romantic idea of the child and its closeness to Nature could be used to show the naturalness and purity of ancient Maori culture. Ideas like these then contributed to forming the image of Maori culture, not just in the writing of Western anthropologists but also when Maori writers described their own culture within a Western discourse. 21Maori and Western world views have in this way been interwoven for the past two hundred years, and in Patricia Grace’s Potiki they are made to complement each other as she skilfully blends together myths of the wonderful and special child from both cultures as background to the birth and life of Toko. Devotion to the sacred child is in Western culture naturally linked to the worship of Christ as a child, the very personification of innocence and goodness, while the demigod Maui is "the epitome of the idealised character in Maori society" since he has all the disadvantages of being a youngest child, a potiki, and yet overcomes his weaknesses to become a saviour of his people.14 Both these myths are reflected in the story of how Toko is conceived and born, as the true identity of his father could be either a carpenter named Joseph, or a Maori ancestral god that Mary embraces in the form of a carving in the community’s whare nui. Though not explicit in the text, the references to the conception of Christ and of a Maori demigod confirm that this child will be special, and his connection to the Maori myth is strengthened as he is born on the beach in a manner which mirrors the birth of Maui. 22This strange child is then connected to the gods of both the Maori and the Christian tradition, and specifically to the gods as they appear as weak but yet powerful children. Like Maui and Christ, Toko is a child who from the very beginning has a special connection to the spiritual world. The opposition between Western modernity and the Maori traditional way of life is in the novel symbolized in the intrusion into the Edenic rural community of a construction company who want to develop the land into a tourist resort. Refusing to sell their land, the community is finally sabotaged by the company, a sabotage in which Toko is killed. The sacred child is in this way shown to be threatened by a Western focus upon gain and progress, just as the traditional way of life and the untouched landscape have been destroyed through the process of colonization. After Toko’s death, however, the people of the community reject their previous attitude of passive resistance in favour of a more aggressive stance and decide to destroy the company’s machines, finally managing to drive the intruders away and regain their land. There is a resurgence of Maori activism and people from all over the country gather to the community as Toko is resurrected as a cultural hero and demigod in the form of a carving in the rebuilt whare nui. The child’s death brings about the changes that are needed for the Maori community to re-establish itself, and it is also used to demonstrate the differences between Maori and Western values. Childhood is linked to the traditional rural Maori world and religion, while the technological and materialistic Western world is shown as a threat to the child and to Nature. 23This essentially Romantic way of opposing the child to civilization is as alive today as it was in the 19th century, strengthened as it is by the Freudian comparison between the child and the unconscious. Another group which has been made into a symbol of the origin of humanity during the past centuries is of course the indigenous peoples of the former colonies, like the Maori people of New Zealand. It is therefore especially interesting to see that the Romantic desire for origin and purity, in these novels by writers of Maori descent, is focused in the child. While these novels do Romanticize pre-contact New Zealand, the fact that a child is made to symbolize the Romantic ideas of Nature and Purity is an important part of the reason why this same child is also sacrificed. The sacrifice preserves the child and thus also the Romantic values, so that the adults can simultaneously retain and distance themselves from the Romantic legacy. 24This mythologizing of childhood then continues the kind of primitivism that made indigenous peoples opposites to Western civilized Man, who claimed to have transcended the’childhood’of humanity but nostalgically missed this state of carefree ignorance unfettered by the constraints of rationalism. Being a child becomes a desired state, but only because it is thought to be impossible for the adult, or the developed and modern human being, to revert to this socalled ‘primitive’ way of existing in the world. In this way both the child and the Native are the Others of society, embodying the difference that is used to define what a human being is. 25When the indigenous people of New Zealand themselves write novels in the Western tradition they naturally reject and work against the image of themselves as Other, and as essentially different from other groups of people. At the same time, there is great potential in the Romantic ideas to criticize modern society and to function as a platform to present alternatives to the western world view. The child therefore becomes the stand-in Romanticized Other, being able to express old-fashioned ideas about Nature and the spiritual world since the child is still considered an essentially different being with a special connection to Nature and Origin. 26In the novels the Maori connection to Nature and to their spiritual world is emphasised, but mainly through a child, as in Potiki or The Whale Rider where a sacred child is bom, with portentous signs and exceptional abilities, a child that is bom for the explicit purpose of saving its community from the degenerate state they have fallen into during the past century. The fulfilment of their destiny only comes, however, after the children have died and been resurrected, either back to life as the new leader of the community in The Whale Rider or to a new existence as a sacred carving and a demigod in Potiki. The children are in this way sacrificed so that the values connected to childhood of Nature and magic can be retained without being explicitly connected to the Maori people. By using the child the authors show the Maori as a dynamic modern people, while still keeping the valued association to a way of life that is opposite to the Western focus upon efficiency and rationality. ARIÈS Philippe, Centuries of Childhood: A Social History of Family Life, New York, Vintage, 1962. BESTON John, "Witi Ihimaera, Maori novelist in a changing society," Commonwealth: Essays and Studies, Vol 3. (1977-78), 19-28. DUFF Alan, Once Were Warriors, Auckland, Tandem Press, 1990. FERRUCCI Franco, "The Dead Child: A Romantic Myth," MLN, Vol. 104, No. 1, Italian Issue, (Jan., 1989), p. 117-134. GIRARD René, Violence and the Sacred, 1972, Transl, by Patrick Gregory, Baltimore, The Johns Hopkins UP, 1977. GRACE Patricia, Potiki, 1986, London, The Women’s Press, 1987. HULME Keri, The Bone People, 1985, London, Picador, 1986. IHIMAERA Witi, The Whale Rider, Auckland, Heinemann, 1987. IHIMAERA Witi, The New Net Goes Fishing, Auckland, Heinemann, 1977. JAMES Allison and PROUT James, "A New Paradigm for the Sociology of Childhood? Provenance, Promise and Problems," Constructing and Reconstructing Childhood: Contemporary Issues in the Sociological study of Childhood, Eds James Allison and Prout Alan. London, The Falmer Press, 1990, 7-34. PEARSON Bill, "The Maori and Literature," Essays on New Zealand Literature, Ed Wystan Cumow, Auckland, Heinemann, 1973,99-138. WALKER Ranginui, "The Relevance of Maori Myth and Tradition," Te Ao Hurihuri: Aspects of Maoritanga, Ed. Michael King, Auckland, Reed Books, 1992, p. 170-182. WEVERS Lydia, "Short Fiction by Maori Writers," Commonwealth: Essays and Studies, 16.2 (Spring 1994), 26-33. WILLIAMS Mark, "Literary Constructions of Oral Cultur," Dirty Silence: Aspects of Language and Literature in New Zealand. Essays arising from the University of Waikato Winter Lecture Series of 1990, Ed. Graham McGregor and Mark Williams, Auckland, Oxford UP, 1991, 77-95. 1 Philippe Ariès, Centuries of Childhood: A Social History of Family Life, New York, Vintage, 1962, 218. What Ariès meant was not, as has sometimes been claimed, that children did not exist or were treated exactly as adults in medieval society, but that our idea of childhood is specific for Western Modernity and that it developed in conjunction with social institutions such as the market economy and the school. 2 Allison James and James Prout, "A New Paradigm for the Sociology of Childhood? Provenance, Promise and Problems," Constructing and Reconstructing Childhood: Contemporary Issues in the Sociological Study of Childhood, Eds Allison James and Alan Prout. London, The Falmer Press, 1990, 7. 3 Lydia Wevers, "Short Fiction by Maori Writers," Commonwealth: Essays and Studies, 16.2 (Spring 1994), 27. See also Bill Pearson, "The Maori and Literature," Essays on New Zealand Literature, Ed Wystan Curnow, Auckland, Heinemann, 1973, 126-137; John Beston, "Witi Ihimaera, Maori novelist in a changing society," Commonwealth: Essays and Studies, Vol 3. (1977-78), 19-20. 4 Anne Higonnet, Pictures of Innocence: The History and Crisis of Ideal Childhood, London, Thames and Hudson, 1998, 39. 5 Williams Mark, "Literary Constructions of Oral Cultur," Dirty Silence: Aspects of Language and Literature in New Zealand. Essays arising from the University of Waikato Winter Lecture Series of 1990, Eds. Graham McGregor and Mark Williams, Auckland, Oxford UP, 1991, 89. 6 Patricia Grace, Potiki, 1986, London, The Women’s Press, 1987, 154-55. A whare nui is a carved meeting house of major importance in Maori culture. 8 Jean-Jacques Rousseau, Emile or On Education, 1762. Introduction, Translation and Notes by Allan Bloom. New York, Basic Books, 1979, II: 324. 10 Pakeha is a Maori word for a New Zealander of European descent which has been included in New Zealand English, and which is commonly used. 11 Franco Ferrucci, "The Dead Child: A Romantic Myth," MLN, Vol. 104, No. l, Italian Issue, (Jan, 1989), 120. 12 René Girard, Violence and the Sacred, 1972, Transl, by Patrick Gregory, Baltimore, The Johns Hopkins UP, 1977, 4-12. 13 Makereti, The Old-Time Maori by Makereti sometime Chieftainess of the Arawa Tribe, known in New Zealand as Maggie Papakura, Ed. T. K. Penniman, London, Victor Gollancz Ltd, 1938, 119 & 137. 14 Ranginui Walker, "The Relevance of Maori Myth and Tradition," Te Ao Hurihuri: Aspects of Maoritanga, Ed. Michael King, Auckland, Reed Books, 1992, 172. Is a PhD student at the University of Göteborg, where she is writing her thesis about the child figure in contemporary New Zealand literature. She finished my master’s degree at the same university in 2001 and was accepted in the graduate program the same year. She has presented papers at seminars at the Universities of Auckland and Otago in New Zealand, where she was invited for a research visit in 2005. ANDERSSON, Ulrika. Childhood and Sacrifice in the Contemporary Maori Novel In : Stories For Children, Histories of Childhood / Histoires d'enfant, histoires d'enfance. Tome II : Littérature / Literature [en ligne]. Tours : Presses universitaires François-Rabelais, 2007 (généré le 19 avril 2019). Disponible sur Internet : <http://books.openedition.org/pufr/4968>. ISBN : 9782869064836. DOI : 10.4000/books.pufr.4968. Andersson, Ulrika. “Childhood and Sacrifice in the Contemporary Maori Novel”. Findlay, Rosie, et Sébastien Salbayre. 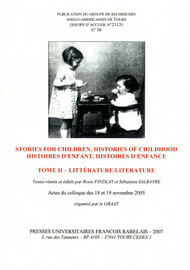 Stories For Children, Histories of Childhood / Histoires d'enfant, histoires d'enfance. Tome II : Littérature / Literature. Tours : Presses universitaires François-Rabelais, 2007. (pp. 285-298) Web. <http://books.openedition.org/pufr/4968>. FINDLAY, Rosie (dir.) ; SALBAYRE, Sébastien (dir.). Stories For Children, Histories of Childhood / Histoires d'enfant, histoires d'enfance. Tome II : Littérature / Literature. Nouvelle édition [en ligne]. Tours : Presses universitaires François-Rabelais, 2007 (généré le 19 avril 2019). Disponible sur Internet : <http://books.openedition.org/pufr/4932>. ISBN : 9782869064836. DOI : 10.4000/books.pufr.4932.